1) Merry Christmas from the Family. Every year, MJ listens desperately to hear Robert Earl Keen's holiday classic, "Merry Christmas from the Family" on KNBT, our local Americana music station here in New Braunfels, Texas. We finally heard it last Saturday morning (Dec. 22) as we were pulling into the Shipley's parking lot for a half dozen doughnuts. 2) Picking pecans. We're lucky enough to have a pecan tree in the front yard and a pecan tree in the back yard, plus one on the neighbor's property that extends into ours. Every other year when the trees produce, we're out there on hands and knees filling up the nut bucket. So far, from the front yard alone, we've got a bushel basket full. I make pecan pies from a Betty Crocker recipe and they consistently turn out very well. What I like is that they're so easy to make yet look impressive; they've kind of replaced pumpkin pie for the holidays in the WetDesert household. 3) Driving to Austin on Christmas eve. The stores were so busy that evidently no Austinites had begun Christmas shopping before today. We went to Whole Foods for some last minute Christmas dinner things, including corn syrup for the pecan pie. Of course, though, the only corn syrup there was $5 for a very small bottle, so I didn't make that investment. I was not yet willing to experiment making the pie with agave nectar. Maybe next year. 4) Driving around Austin on Christmas eve looking for a restaurant that is still open. We knew our favorite, the Green Mesquite, was closing at 4. We remembered that Guero's Taco Bar was closed for the day. We were actually counting on the Magnolia (open 24/8 as the website advertises), but alas, they too had closed their doors. Thinking desperately, MJ suggested the Baker's Street Pub and Grill by the Half Price Books on South Lamar. It was indeed open and I had a Lone Star and fish 'n' chips. MJ had the Shepherd's pie. Frosted glass at the brewpub. 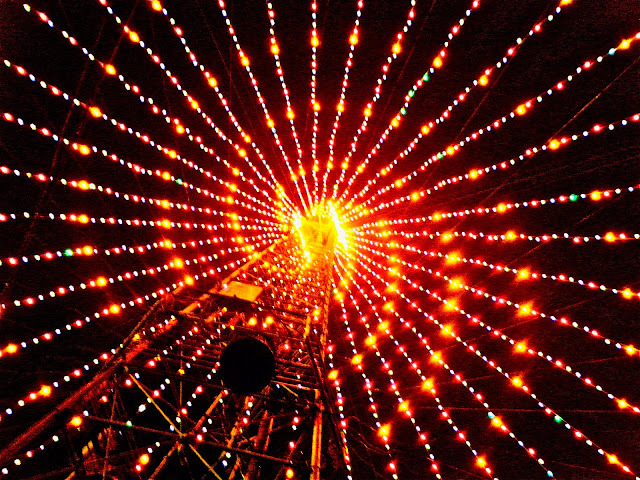 The Zilker Tree stands 155 feet tall and is composed of 39 streamers, each holding 81 multicolored, 25-watt bulbs - totaling 3,309 lights. At the top of the tree, a double star measures 10 feet from point to point. The double star displays 150 frosted bulbs. This unique spiral pattern of lights was created by City of Austin electricians. At its circumference, the tree measures 380 feet. The diameter is 120 feet. The base of the tree is made up of 19 utility poles, each 14 feet tall, arranged in a circle around the Moonlight Tower. Under the tree. Use caution when looking up and spinning. 6) Driving around looking at Christmas lights. I feel this one is fairly common. We used to do it when I was growing up in northeast Iowa. Saw a light up reindeer that was supposed to be flying but more just looked like it was stuck in a tree. Actually, the real treat was peeping into people's houses at *their* family gatherings in lieu of having our own. 7) Shopping at Walgreens. If there ever is a time to need a 24 hour drugstore, Christmas is it. At about 8pm on Christmas eve, we hit up the Walgreens just a few blocks from our house and the place was packed. We got the following: Alka Seltzer, corn syrup, orange juice (for Christmas morning mimosas and MJ's cold) and a couple of candy bars.